The BRFC met at The Natural History Museum, London, on 22nd November 2018. Present were: Oliver Crimmen (Scientific Advisor, Natural History Museum), Andrew Nellist (Freshwater Specialist), Paul Coulson (Freshwater specialist), Nigel Hewlett (Scientific Advisor, Environment Agency) and Nick Simmonds (Secretary). Lawrence King’s Orfe (or Ide) (Leuciscus idus (L)), caught from Newdigate Farms Fishery on 29th May, which equals the record at 8lb 5oz. Jason Touzel’s shore-caught White Sea Bream (Diplodus sargus), caught from the west coast of Jersey on 11th May and ratified at a weight of 3lb 3oz 2dr. 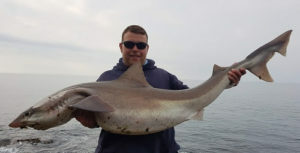 Jason’s fish was witnessed by Roger Bryant, the previous record holder for this species. Cameron Atkinson’s shore-caught Spurdog (Squalus acanthias), from Watermouth on the north Devon coast on 24th January. Ratified at 18lb exactly. As reported in our previous press release, the claims in respect of these three fish had been approved for ratification by the respective freshwater and marine specialist groups of the BRFC and the captors had been notified of provisional record awards pending full ratification. Ratified record certificates will now be issued to the captors. Ryan Wingfield’s shore-caught Tope (Galeorhinus galeus), caught from Strumble Head, Pembrokeshire on 25th May. 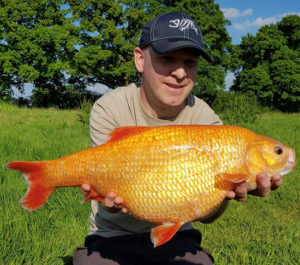 Ryan claimed his fish at a weight of 73lb 2oz but the scales test showed the scale to be reading significantly light and consequently Ryan’s fish was ratified at 75lb. Somewhat smaller is David Lynes’s Baillon’s Wrasse (Crenilabrus bailloni), weighing in at 285 grams. David caught his fish from a boat in Poole Bay on 3rd September. The Baillon’s Wrasse is listed in the “Mini-species” listing for fish weighing under 1lb and Mini-species records are recorded in grams. The last and most recently caught of our ratified records is John Varcoe’s boat-caught Almaco Jack (Seriola rivoliano), which John caught on 5th October from a reef off Polzeath, Cornwall, ratified at 2lb 1oz 14dr. Because this fish is externally indistinguishable from a sister species it was subjected to an X-ray examination at the Natural History Museum, to show the only distinguishing feature – a bone which is straight in this species but curved in the other! capture of the fish known as Captain Jack from Holme Fen Fishery in Cambridgeshire and unanimously agreed that this fish should not be accepted as a British record. accept this claim as a credible British record. The most significant factors contributing to this decision were the relatively high weight of the fish upon importation and upon stocking into the fishery, and the fact that the fishery had been subject to an artificial feeding regime for a considerable time following the original stocking. The Committee has embarked on a project to electronically record its archive of record claim files, decisions and records of meetings dating back to the formation of the British Record (rod-caught) Fish Committee in 1957. The committee is grateful to the Angling Trust for providing the office facility for storage of records and transfer to digital format; to Paul Forman for providing the scanner and in particular to our volunteer, Simon Richards, who is giving up his time to create the electronic version of the record files. The Committee would like to remind readers that in the event of the capture of a potential record fish, the captor should first contact the British Record (rod-caught) Fish Committee without delay.